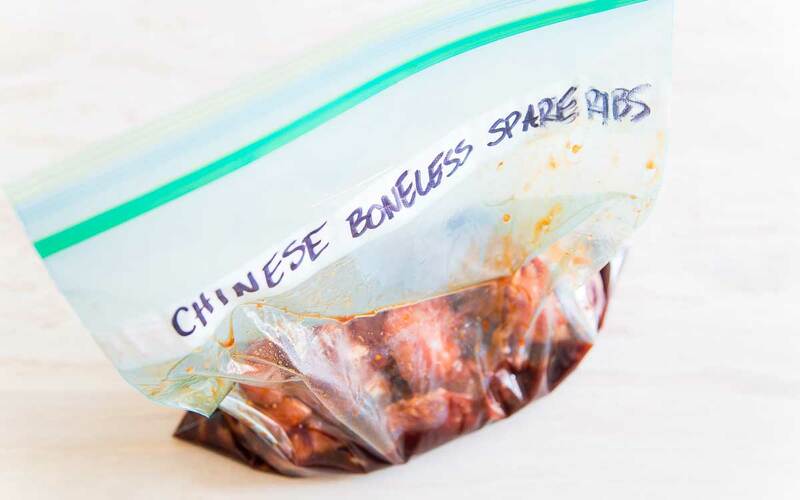 These Chinese boneless spare ribs are just like the takeout recipe. Sticky and sweet with crispy edges and that deep red color. Learn how easily you can make them at home! Takeout options in our town are pretty slim. It’s pretty much either pizza or Chinese, everything else is just too far away to warrant takeout. If you want another cuisine, you basically have to go out and make a meal of it. Because of this, we eat our fair share of Chinese takeout. Usually, that just means a small wonton soup for me and a shared container of boring chicken and broccoli. But a few months back, Ulysses threw a curve ball into our typical takeout order and came home with a small container of boneless spare ribs. It was like an immediate throw back to my childhood. I don’t think I’ve had a Chinese spare rib since takeout as a kid. Traditional Chinese spare ribs, the ones with the bone were always in the order when we got takeout growing up. Somewhere in the last 20+ years though I completely forgot about them. You know how Chinese takeout menus go, there’s approximately 500 things on them, 75% of which you have no idea what they even are and you order the same 5 items in rotation every single time. These spare ribs were not in our regular rotation so they threw me off my game entirely. I ate my wonton soup, put a normal sized serving of rice + chicken and broccoli on my plate and added a few of the boneless spare ribs on the side thinking I wouldn’t really be into them. How wrong I was. I think I went back 3 times for more until eventually we both just polished off the entire container between comments like “these are SO good” and “we need to order these more often!”. Needless to say, boneless spare ribs have been on our Chinese takeout order ever since and I found myself examining them a little more thoughtfully wondering if I could replicate them at home in a slightly better for you but still authentic way. I’ve tried to copycat a few restaurant dishes here and there but I can confidently say this recipe for Chinese spare ribs is by far the best replication I’ve managed to date. And the best part is how simple it is. 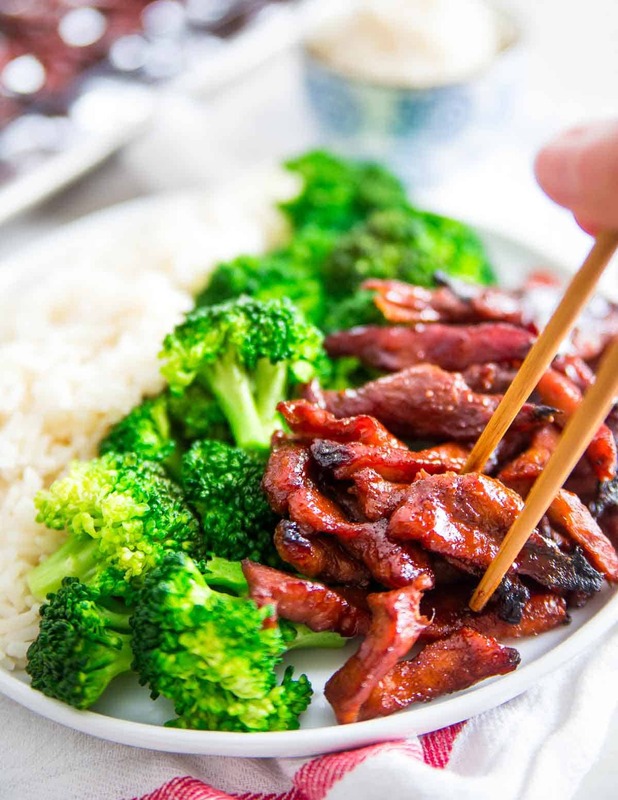 The key in how to make boneless spare ribs that taste just like Chinese takeout is all in the marinade and letting the pork absorb all that flavor overnight. First, you start with your pork. You can use either boneless pork spare ribs if you can find them or, boneless pork loin like I did here (which also keeps the fat content quite a bit lower). Slice the pork into thin strips. Keeping the slices thin helps the edges crisp up and get that crunchy texture like the takeout dish has. It’s best to let the pork sit in the marinade overnight but if you’re short on time, 4 hours or so will do. The cooking technique is probably not what you expect for boneless spare ribs. Those crispy edges make you think they’d be fried but these actually get baked in the oven. 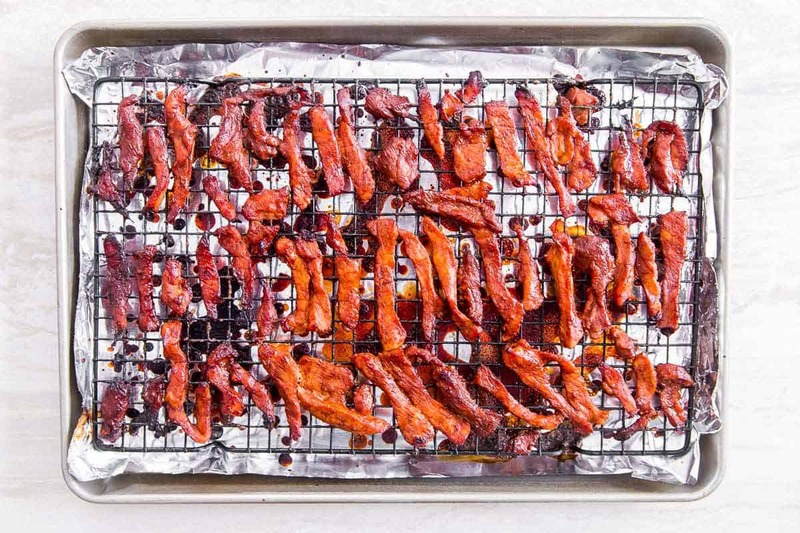 The trick to a crispy bake on these is to lay them on a baking rack on top of baking sheet. This allows the heat in the oven to circulate around all the edges getting them nicely browned and crispy. Brushing the pork with the extra marinade while it cooks also helps with that sticky glaze that makes Chinese spare ribs so delicious. If you love sticky, sweet and savory foods, you will absolutely love these pork spare ribs. They remind me a lot of this sticky honey soy pork chop recipe actually which is like the non-takeout version of this recipe. What Can I Substitute For Chinese 5 Spice? Chinese 5 spice powder/seasoning is a pretty crucial ingredient in the flavor of these pork spare ribs so omitting it isn’t really an option. If you don’t have a Chinese 5 spice powder on hand though you probably have all the components that go in it individually: cinnamon, fennel, cloves, star anise, white pepper. Regular pepper is fine to substitute for white pepper (I admittedly don’t even keep white pepper on hand). Is There Another Option For Red Food Coloring? 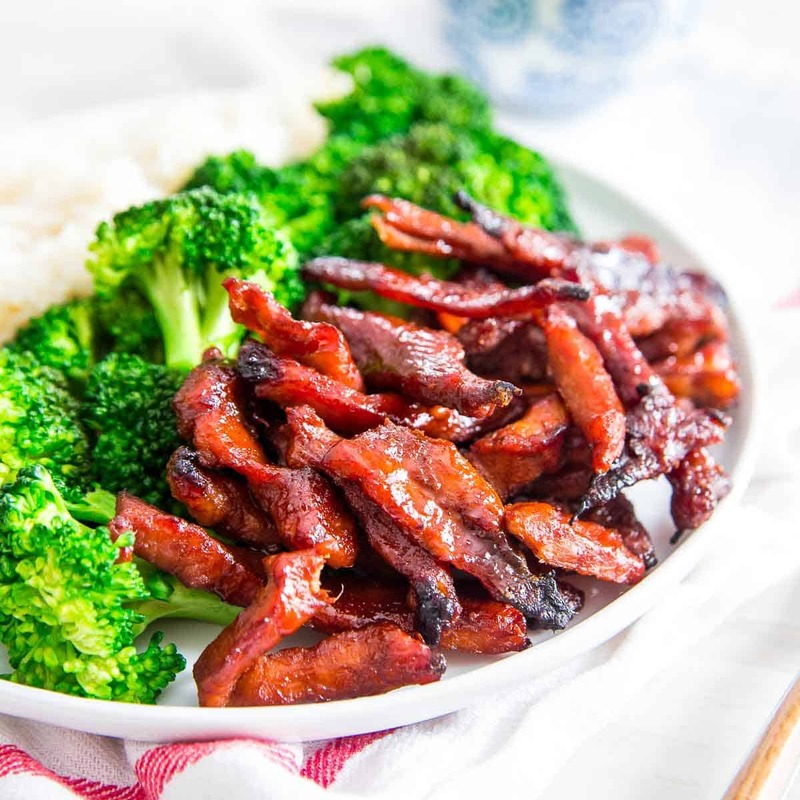 That said, if you want the traditional “look” to Chinese boneless spare ribs, you need to use some coloring agent for that red appearance. Some options are natural red food coloring (there are a lot of options out there!) or beet root powder. Of course, you can just omit this ingredient and the spare ribs will taste just as good, they just won’t have that “traditional” color. Want more recipes like these boneless spare ribs? Try this 20 minute pork ramen stir fry, Thai pineapple fried rice, hot and sour egg drop soup or, this easy 5 spice cream cheese chicken skillet dinner that is super delicious and decadent! And if you’re looking for a “real” rib recipe, don’t miss these sticky maple apple pork ribs – they’re fall off the bone tender and finger licking good! 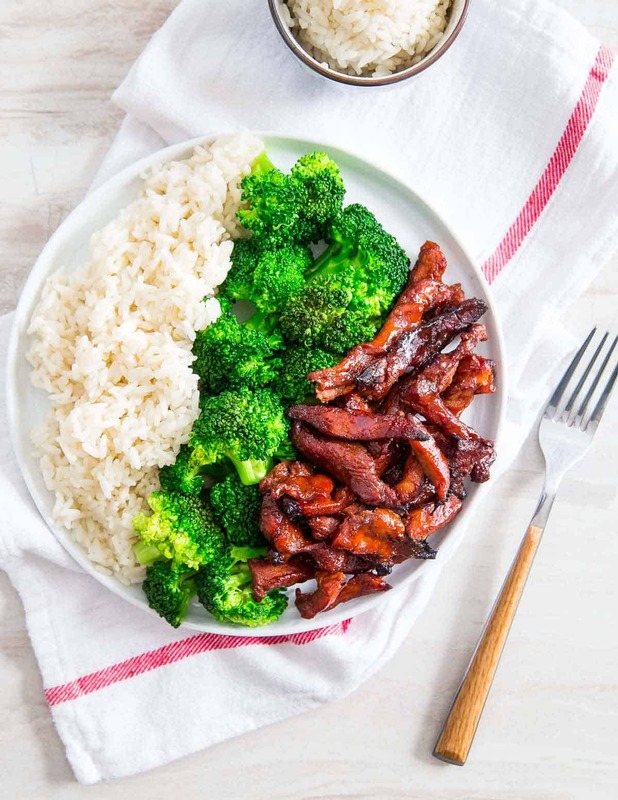 These Chinese boneless spare ribs are just like the takeout recipe. Sticky and sweet with crispy edges and that deep red color. You can easily make them at home! Thinly slice the pork into strips about 3" long and place in a large sealable plastic bag. Whisk together the remaining ingredients in a small bowl until well combined. Pour the marinade into the plastic bag with the pork. Seal the bag and place in the refrigerator overnight or for at least 4 hours. When ready to cook, preheat oven to 350°F. Line a large baking sheet with aluminum foil and place a baking rack on top. 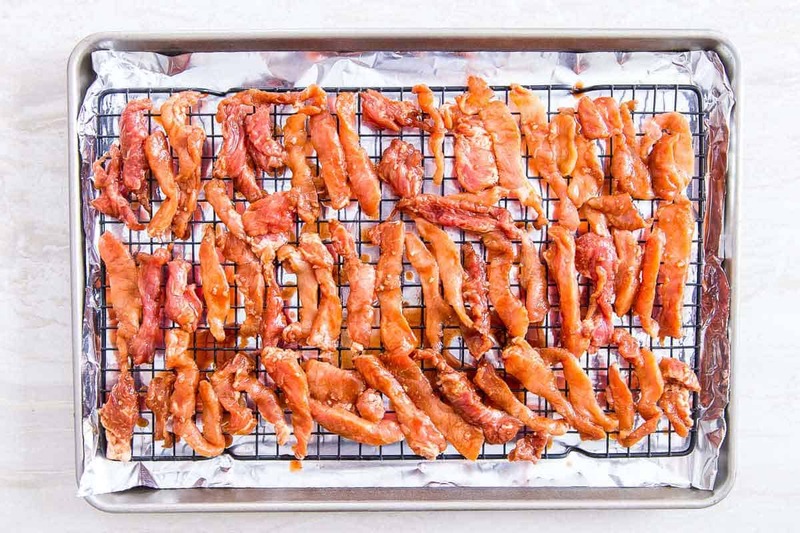 Place the pork slices on top of the baking rack. Reserve any extra marinade. Bake for 40-45 minutes brushing the pork slices with the extra marinade 2-3 times while cooking. Broil for last 1-2 minutes for extra crispy edges. Remove from oven and serve with rice and steamed vegetables. Best enjoyed immediately. 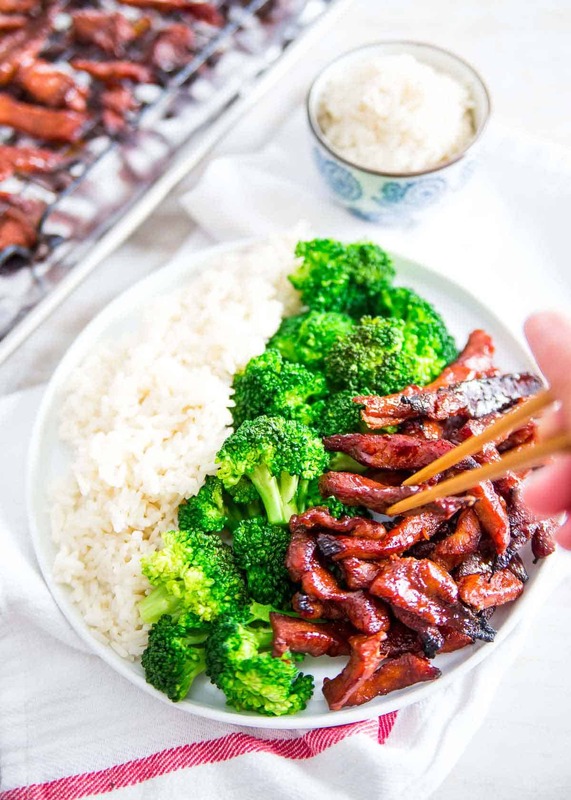 **Red food coloring is optional but gives the boneless spare ribs that classic red color of takeout. Beet root powder is an alternative option as well. These hit the spot completely for me and tasted better than a restaurant. Thank you so much for the recipe! I had never tried boneless spare ribs before and it was great! The video was really great to watch as well thank you. Can you substitute beef? What cut? I’m sure you could but they won’t taste like the takeout version. I haven’t done it but I’d probably use flank or skirt steak cut into thin trips. You could also do boneless beef short ribs. I love Chinese spareribs. These look amazing and so easy! How would you reheat leftovers? Probably just microwave. They’re better when first made though.